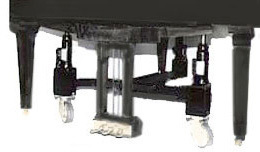 Apart from its ease of use and convenience, the Grand Transporters© are perfect for use in Theatres, Concert Halls, on Stages etc., where aesthetics are important and you don't want to see a Truck Dolly under the piano. If you're in a venue with several pianos, it takes the place of having to buy many different sized Grand Piano Truck dollies, and you also won't need 2 or 3 people to move the pianos. These heavy duty dollies, have 3 hydraulic jacks that will lift and move size 4ft. to 9ft. grand pianos, weighing up to 3000 lbs. In less than one minute, one person can position the Grand Transporter© under the grand piano, lift the piano off the floor and move it. 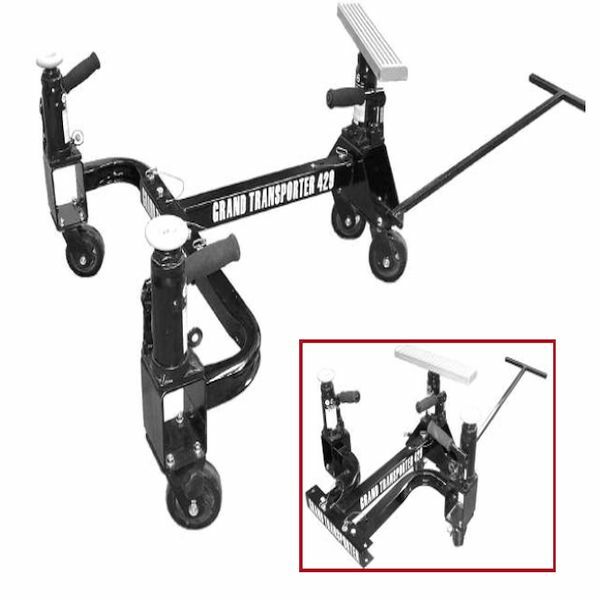 Excellent for replacing wheels, legs or brackets, the 'Transporter' will also sit over a grand Piano Truck Dolly, so it lifts the piano to install or remove the dolly. 4001-AT - All Terrain - Heavier Frame and 10" Pneumatic Tires - $2325.00. Folds easily for storage and for moving from place to place. Designed & built in the USA.